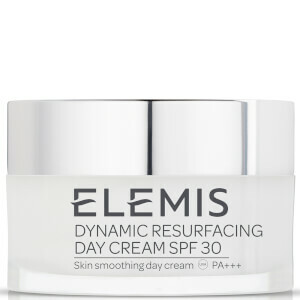 Treat your complexion to the Elemis Dynamic Resurfacing Smooth Start Collection; a four-step routine to improve skin tone and texture. Housed in a branded box. A daily face wash that works to cleanse and lift impurities from the skin whilst promoting a smoother, more refined texture and renewing radiance. 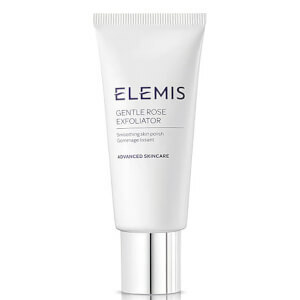 Its formula gently resurfaces and exfoliates the skin, actively smoothing and sloughing away dead skin to leave your complexion cleansed and revitalised without over-drying or uncomfortable tightness. Dual-action, skin-refining pads that sweep effortlessly over the face to promote a smooth, even complexion. Powered by Patented Tri-Enzyme Technology and Lactic Acid (a mild AHA), the retexturising pads gently exfoliate the skin's surface to eliminate dead skin and impurities, without stripping moisture. An innovative Pro-Biotic Ferment Complex supports the skin's self-renewal process for a bright, healthy-looking visage that feels revitalised after each use. A revolutionary formula dedicated to smoothing and refining the surface of your skin. Delivering a pleasant tingling sensation upon application, the treatment combines revolutionary Patented Tri-Enzyme technology with Amazonian Acerola Cherry, White Truffle and Great Burdock to promote a clarified and balanced complexion. Skin is left soft, bright and shine-free. An innovative facial treatment that performs a non-abrasive peeling action to help smoothen the appearance of your skin whilst reducing the look of pores and wrinkles. Clinically proven to improve the complexion, the skin-smoothing formula combines resurfacing technology with four plant Alpha Hydroxy Acids to gently dissolve dead skin. Its dose of Selastin™ (an ingredient derived from marine plants) targets enlarged pores, whilst Amino Acids and encapsulated Vitamin C expertly tone, smooth and brighten the skin's surface. Face Wash: Use daily, morning and evening. Mix into the palms, adding a little warm water and gently massage over the face, neck and décolleté with light circular massage movements. Rinse off and pat the face dry with a clean towel. Pads: Smooth pad, texture side down, over the face in a circular motion morning and evening, after cleansing. For optimum results, use as part of the Dynamic Resurfacing program. Mask: Use weekly. Apply onto cleansed skin, avoiding the eye and lip area. Leave on for 8-10 minutes and remove with warm water. On application, you will experience a powerful tingling sensation. 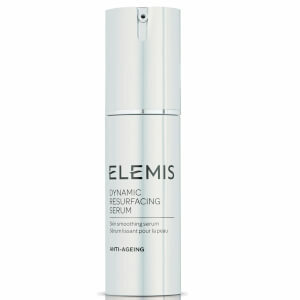 Serum: Use morning and evening, avoiding the eye area. For optimum results, use as part of the Dynamic Resurfacing programme. Face Wash: Aqua/Water/Eau, Sodium Lauroyl Sarcosinate, Glycerin, Cocamidopropyl Betaine, Acrylates Copolymer, Polysorbate 20, Coco-Glucoside, Glycol Distearate, Glyceryl Oleate, Sodium Lactate, Dicaprylyl Ether, Phenoxyethanol, Lauryl Alcohol, Fragrance (Parfum), Sodium Chloride, Orbignya Oleifera (Babassu) Seed Oil, Xanthan Gum, Caprylyl Glycol, Propylene Glycol, Sodium Hydroxide, Chlorphenesin, Citric Acid, Glyceryl Stearate, Papain, Disodium EDTA, Galactoarabinan*, Behenyl Alcohol, Butyrospermum Parkii (Shea) Butter, Benzoic Acid, Moringa Pterygosperma Seed Extract, Hydrogenated Castor Oil, Disodium Phosphate, Stearyl Alcohol, Protease, Subtilisin, Tocopherol, Hydrogenated Palm Glycerides Citrate, Poria Cocos (White Truffle) Extract. *Extracted from Larch Tree. Pads: Aqua/Water/Eau, Butylene Glycol, Lactococcus Ferment Lysate, Polysorbate 20, Methyl Gluceth-20, Lactic Acid, Phenoxyethanol, Betaine, Propylene Glycol, Disodium EDTA, Benzoic Acid, Sodium Hydroxide, Fragrance (Parfum), Dehydroacetic Acid, Tromethamine, Ethylhexylglycerin, Papain, Saponins, Sodium Benzoate, Sodium Chloride, Glycerin, Behenyl Alcohol, Butyrospermum Parkii (Shea) Butter, Hydrogenated Castor Oil, Stearyl Alcohol, Poria Cocos Extract, Protease, Saponaria Officinalis Leaf/Root Extract, Subtilisin, Tocopheryl Acetate. Mask: Aqua/Water/Eau, Polysorbate 20, Glycerin, Menthyl Lactate, Propanediol, Propylene Glycol, Tromethamine, Phenoxyethanol, Carbomer, Butylene Glycol, Bambusa Arundinacea (Bamboo) Stem Extract, Xanthan Gum, PEG-120 Methyl Glucose Dioleate, Fragrance (Parfum), Chlorphenesin, Disodium EDTA, Papain, Mannitol, Sodium Dehydroacetate, Malpighia Glabra (Acerola) Fruit Extract, Behenyl Alcohol, Butyrospermum Parkii (Shea) Butter, Arctium Majus (Burdock) Root Extract, Citric Acid, Glycolic Acid, Hydrogenated Castor Oil, Stearyl Alcohol, Caramel, Zinc Sulfate, Subtilisin, Protease, Poria Cocos (White Truffle) Extract, Acetyl Tetrapeptide-9, Biotin, Potassium Sorbate. Serum: Aqua/Water/Eau, Coco-Caprylate, Glycerin, Propylene Glycol, Steareth-2, Phenoxyethanol, Steareth-21, Carbomer, Butylene Glycol, Betaine, Behenyl Alcohol, Butyrospermum Parkii (Shea) Butter, Xanthan Gum, Fragrance (Parfum), Sodium PCA, Chlorphenesin, Caprylyl Glycol, 1,2-Hexanediol, Sodium Lactate, Lactic Acid, Arginine, Sorbitol, Ethyl Ascorbic Acid (Vitamin C), Bentonite, Lecithin, Tocopherol, Hydrolyzed Hyaluronic Acid, Malpighia Glabra (Acerola) Fruit Extract, Disodium EDTA, Hydrogenated Castor Oil, Aspartic Acid, Stearyl Alcohol, PCA, Protease, Hibiscus Sabdariffa Flower Extract, Freesia Alba Flower Extract, Lilium Candidum Flower Extract, Gardenia Tahitensis (Tiare) Flower Extract, Glycine, Benzyl Alcohol, Papain, Lonicera Japonica (Honeysuckle) Flower Extract, Lonicera Caprifolium (Honeysuckle) Flower Extract, Benzoic Acid, Alanine, Serine, Valine, Subtilisin, Isoleucine, Threonine, Proline, Tocopheryl Acetate (Vitamin E), Poria Cocos (White Truffle) Extract, Tropolone, Phenylalanine, Histidine, Codium Tomentosum Extract*, Gelidium Cartilagineum Extract*, Ecklonia Cava Extract*, Hizikia Fusiforme Extract*, Sodium Hydroxide, Sodium Phosphate, Faex Extract/Yeast Extract/Extrait de levure, Potassium Sorbate, Dehydroacetic Acid. *From Selastin™.